Room was clean, comfortable and quiet. Hotel is only a 15 - 20 minute walk to the city centre. Convenient car parking. Room good as it seemed brand new. Good bus service to/from centre of Dundee. As a bedroom only option for a night between locations it was good value for money. Well made bed crisp clean sheets and nicely folded towels. Which was basically all we needed (a place to sleep on a long road trip). Knew it was on an industrial estate edge of town and as such was fairly quiet location.. Person on end of phone really cheerful and helpful but not the clearest English. Location was fine as had own transport and was just passing through.. once renovated might be able to ask more and more likely to be recommended as off street parking a bonus. The "highlights" were the comfortable bed and hot shower, but these are both basic expectations for any hotel. Breakfast was not available. Location was OK, only about a mile from the city centre and it's on a bus route. But it felt a bit isolated, as it's on a very quiet street. 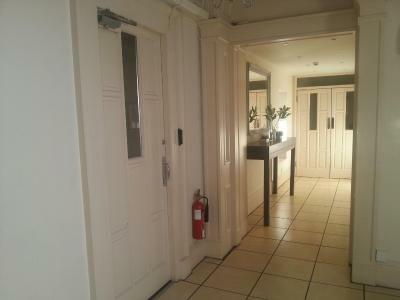 The apartments are convenient for the city centre and in a quiet location. I booked a double room and only had a twin room when I arrived which the staff apologised for and very pleasantly agreed to let me swap rooms to a double when I texted them. Craigtay Apartment Hotel This rating is a reflection of how the property compares to the industry standard when it comes to price, facilities and services available. It's based on a self-evaluation by the property. Use this rating to help choose your stay! Located near Dundee city center, Craigtay Apartment Hotel offers rooms with contemporary design and on-site private parking free of charge. The property benefits from free WiFi in all rooms. Rooms at Craigtay Apartment Hotel come with a TV, a writing desk and tea and coffee making facilities. They also consist of a private bathroom fitted with either a bathtub or a shower and a hairdryer, and free toiletries are provided. Some rooms are equipped with cooking and laundry facilities. The center of Dundee with its many pubs, cafés and historical landmarks is a 15-minute walk away. Aberdeen is 41 mi from the accommodations and Edinburgh with its international Airport is located 39 mi away. When would you like to stay at Craigtay Apartment Hotel? An private bathroom, a TV, and a work desk feature in this room. An private bathroom, a TV and a work desk feature in this room. House Rules Craigtay Apartment Hotel takes special requests – add in the next step! Debit card Craigtay Apartment Hotel accepts these cards and reserves the right to temporarily hold an amount prior to arrival. Craigtay Apartment Hotel accepts these cards and reserves the right to temporarily hold an amount prior to arrival. Please inform Craigtay Apartment Hotel of your expected arrival time in advance. You can use the Special Requests box when booking, or contact the property directly using the contact details in your confirmation. Being woken up by fire alarm. Self check in. No staff on hand at check in. Keys are held in a combination safe that you need a code to access. Didn't get one so had to call someone to get it. No breakfast facilities. VERY sensitive fire alarm. Almost everything.......no food ....no drink ....no staff ....rooms not cleaned...had to gather in the car park at some ungodly hours because the fire alarm went off 4 times in 4 days due to a fault....no staff to sort it out......when I booked this hotel my booking confirmation clearly stated that the price included breakfast & that food would be available lunch & evening...all of which was incorrect!! Unable to contact owner prior to arrival so had to ring her to find out how to get the key to our room. Tea/coffee supplies were not replenished and the bed linen and towels were not changed at anytime during our 7 night stay. We think the whole hotel is in a state of refurbishment and should not currently be open for business. Each time we returned to the room it smelt of cigarette smoke, probably from the builders. Didn't find location easy to find without sat nav or smart phone as city center had road works. Sadly room reeked of smoke, maybe coming up plug from another room as was better if kept bathroom door closed. Table lamb had no bulb, no bedside tables. Certain aspects of the room and bathroom decor and fittings had been upgraded / replaced but finish wasn't the best and things still needing to be done. Knew the floor below was being renovated and that that was why it was such a good price, but the corridor and stairs carpets were worn and shabby and the reception area, while being unmanned was fine, felt very dingy and uninviting. However when a case with camera in it was inadvertently left in this area open to the street, we returned 4h later and it was still there as corner so dark folks coming in and out from the bright street had overlooked it.. which was a relief. far too noisy with other apartments especially as it states quiet times from 20:00. The hotel is in a terrible location especially if you do not have a car. The room also looked very different to the images on the website. This basically amounts to false advertising. The room and furniture was very tired and outdated with stains on the walls and curtains. One section of the floor felt like it could give-way when stepped on. Shortly before arriving I received a text explaining that there would be no one to meet us but key-safe instructions were provided. The reception was actually never opened, nor was the bar. The hotel is also under renovation, which was apparently reflected in the reduced prices, according to the text. This was the first time I was made aware of the renovations and actually the prices were not reduced at all. In fact it was definitely over-priced. The entire hotel is definitely in need of renovation and I would also suggest that they open the windows occasionally to get rid of the lingering smell in the entrance and stairs. The window to our room was left wide open before we arrived (which seems to be common practice despite the cold winter conditions) and our first impressions were disheartening. We had a couple of quiet nights when there were no guests next to us but otherwise the walls are thin and the noise from the next rooms was very noticeable. Once I looked more carefully at the reviews I noticed that these issues have been ongoing for a number of years, without signs of improvement. We did not complain at the time as we had come a long distance and did not want to risk being given a worse room. Our impression of Dundee was definitely tainted by staying at Craigtay. We learned a valuable lesson: ALWAYS read the reviews in detail. No staff present when I arrived or left. It was a self check in using a code and a key box. I think lone female guests would find it a bit scary. The hotel was being renovated and rather than get an apartment like it says on the site I was given a double room. The hotel front doors weren't locked at night and I was woken up by three drunk kids trying to get a key for there room that they booked as the person meant to be Manning the hotel didn't answer there phone. Wouldn't go back! Getting out of the place was the best part. Walking distance to the centre. Clean linen.